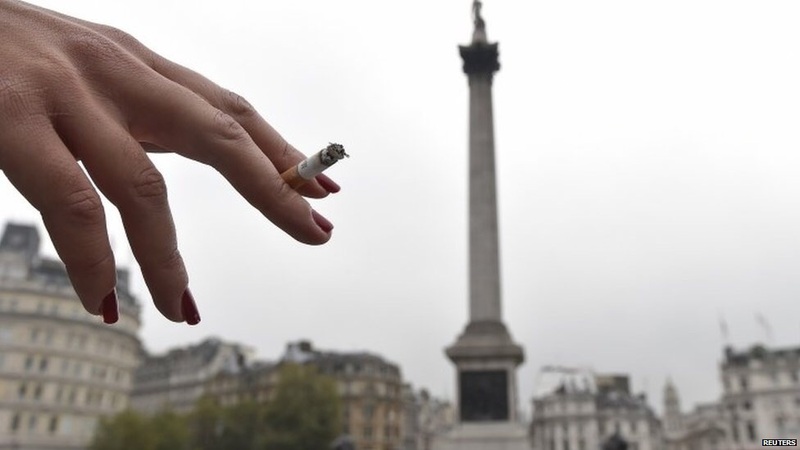 Banning smoking in Trafalagar Square and public parks…the next step to a complete smoking ban? In 2011, New York City introduced a ban on smoking in Central Park, in addition to all of the city’s parks and beaches. This week London took a step closer to something like this, when it was suggested that smoking could be banned in Trafalgar Square, Parliament Square and London Parks. How far could this go? The suggestion came as part of a package of measures listed in a report by the city’s Health Commission, led by Lord Darzi, the former Health Minister and Cancer surgeon. Darzi was asked by Mayor Boris Johnson to come up with proposals to make London’s citizens healthier. – An acceleration of measures to reduce air pollution in the capital. But the headlines were grabbed by the idea of banning smoking in some outside public places in London, in addition to the ban on smoking indoor public places that has been in place for quite a while now. The Health Commission noted that around 1.2 million Londoners smoke, and, of more importance, 67 school children are taking up the habit every day. This may be another step towards the complete banning of smoking, and will cost quite a lot to monitor, but it seems that war continues to waged on smoking. Will anything work other than a complete ban? Is a complete ban fair? The debate continues. I disagree with the statement made by the member of the public saying the ban on smoking indoors lead children to be more exposed to smoking. In some cases this may be true for example in bars and clubs, where children aren’t allowed access, therefore when smokers smoked indoors they were hidden away from the underage, but as these smokers were forced onto the street, where children are free to ‘explore’, the two parties come into contact, potentially tempting children. However, the majority of buildings are open to children, and when these buildings were home to smokers, this exposed children to smoking on the street and indoors, where they almost could not escape from smoking, which leads to children thinking it to be the norm, and taking part themselves. On a different note, I think the question is not “Is a complete ban fair?”, however it should be what is most beneficial to the majority of society, which points to this ban. The issue is about limits to our liberty. Can we really ban something that is a choice to do? We can make absolutely sure it is less likely to harm other people, but Forest and other pro-smokers’ rights groups are arguing that this is a slippery slope towards a complete ban. That would effectively criminalize something – with a lot of associated costs of monitoring and enforcement etc. Where is the line on this?